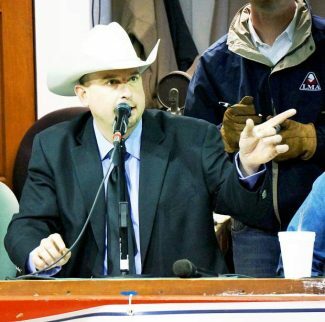 Knoxville Regional Livestock Market, Knoxville, Iowa, will host the 2014 World Livestock Auctioneer Championship (WLAC) June 19-21 in conjunction with the Livestock Marketing Association (LMA) Annual Convention at the Des Moines Marriott Hotel. In addition, the reigning World Livestock Auctioneer Champion, Dustin Focht, along with many past world champion auctioneers, will be attending this year's contest. For the world champion auctioneer title, 31 semi-finalist auctioneers will compete in live interview and auctioneering contests. Because of this important, high-profile role, each WLAC semi-finalist must establish their knowledge of the livestock marketing business, and demonstrate their ability to express that knowledge with clarity, in a live interview competition. The interviews will be on Friday, June 20, at the Des Moines Marriott Hotel. The interview competition can be viewed live on http://www.LMAauctions.com starting at 2 p.m. (CST). The Saturday, June 21, auctioneering competition at Knoxville Regional Livestock Market begins at 8 a.m. (CST) and is a live sale where the contestants auction cattle to actual bidders in the seats. The auctioneering competition will be streamed live beginning at 8:00 a.m. (CST) on http://www.LMAauctions.com and broadcast as a special, one-hour show on RFD-TV June 30, starting at 8 p.m. (ET). Contestants from the following states are competing: Alabama (3), Arizona (1), Arkansas (1), California (5), Colorado (1), Iowa (5), Illinois (1), Kansas (2), Kentucky (1), Minnesota (1), Ohio (2), Oklahoma (2), South Carolina (2), Tennessee (1). There are three contestants from Canada.